Earlier this month Kotaku reported, per 2K Sports itself, that the historic teams featured in NBA 2K12's "NBA's Greatest" mode would not be available for online play. That turns out not to be the case. A Twitter photo from someone with the game already shows that gamers can take the 1993 Chicago Bulls or 1986 Boston Celtics online, along with any of the 32 other storied teams—for a price. 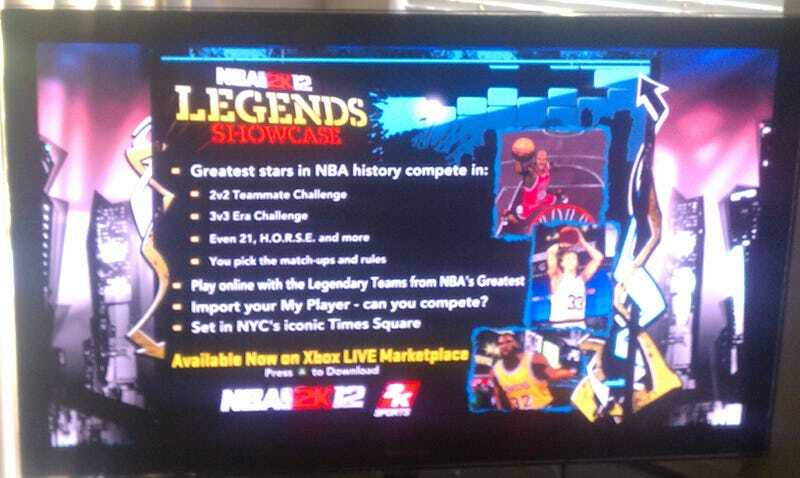 A "Legends Showcase" will be offered for an as-yet unknown amount. While it gives players game modes of 2-on-2, 3-on-3, H.O.R.S.E. and 21 and a fantasy court set in Times Square, the biggest value it exploits is the ability to play the NBA's Greatest teams in online multiplayer. The 32 standard NBA's Greatest teams are included on the disc (two are accessed by a code that will be included with all retail copies at release but in limited quantities), but are unlocked by winning games in that mode. As the NBA is currently in a lockout that has canceled training camps' regular openings and exhibition games, the value of historic teams to online multiplayer is quite large. Until the league returns to work, players will be stuck with a base roster that reflects the league on the last day of the season—not even rookies from June's amateur draft will be included until the lockout is resolved. "Legends Showcase" will also allow for the importation of one's created player in the game's "My Player" career mode, according to the screen shot. The decision could jeopardize the goodwill 2K Sports has quietly built up as the lone publishing holdout ensuring that all game content is accessible from the disc. As publishers have offered boosts, cheats, uniforms and other skins, or walled off online multiplayer access behind one-use codes designed to protect retail sales, 2K Sports has steadfastly stamped discs that give gamers everything. But this move may have been forced by the reality of the NBA lockout and the threat it poses to sales of 2K Sports' bread and butter franchise. It may be unfortunate that it's come to this. But it was inevitable it came to this.